Jacob Haish was in this morning to set our minds at rest as to who was the oldest "residenter" of DeKalb still in existence here. 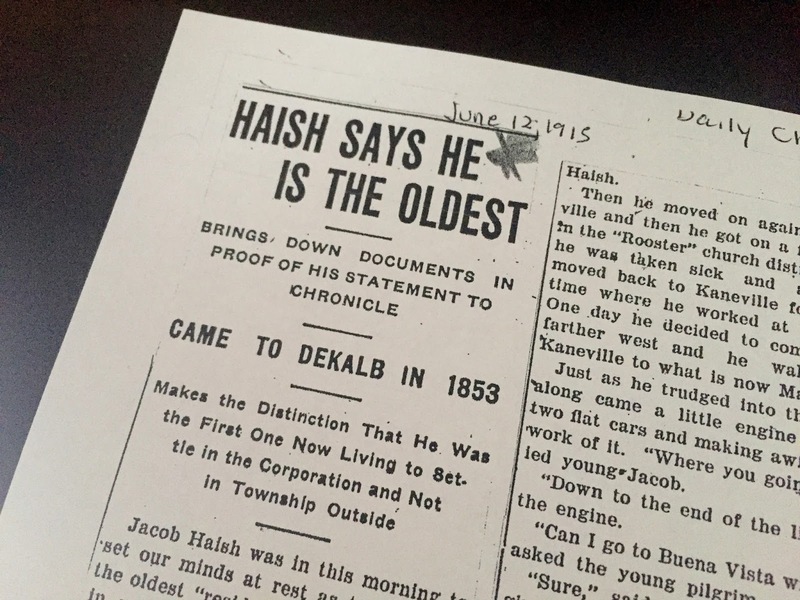 Mr. Haish claims the honor for himself and has the documents to prove it. He says that he is the first settler of the tract at present inside the corporate limits of DeKalb, who is still living. He came here in September of 1853. There were others who lived outside the city limits on farms but if they moved to DeKalb they did it many years later. To prove his statement Mr. Haish had the deed to his first piece of property he owned in this city, the lot on South First street south of the Northwestern tracks on the east side of the street. He bought this, he says, in 1858, but did not have the money to pay for it and was not given his deed until the following year. The deed bears the date of December 1854. A couple of years afterward, about 1855, he says a lot of other people came here, Robert Newitt, the Garners, the Rolfes, Bristows, Bradts, Brooks, Sweets and others. Then he moved on again to Kaneville and then he got on a farm down in the "Rooster" church district. Here he was taken sick and afterwards moved back to Kaneville for a short time where he worked at his trade. One day he decided to come a little farther west and he walked from Kaneville to what is now Maple Park. Just as he trudged into this village along came a little engine dragging two flat cars and making awfully hard work of it. "Where are you going?" queried young Jacob. "Down to the end of the line," said the engine. "Can I go to Buena Vista with you?" asked the young pilgrim. "Sure," said the good natured engineman and Jacob hopped aboard. When he came to the end of the road, about where Fourth street now is the train had to stop and the young pioneer asked the engineer, "Where's Buena Vista?" "This is it," said the engineer pointing down the street to where there a couple of little buildings and this was Jacob Haish's advent into DeKalb. Buena Vista, for the benefit of those who don't know, was the old name for this village. There was little of a village here when Mr. Haish arrived. Dr. Basil had a little shack of a store where Hiland's store now is, and Goodell had a general store where the Chronicle is now located. There was a blacksmith shop where the Glidden house now is and that was about all the business houses there were. 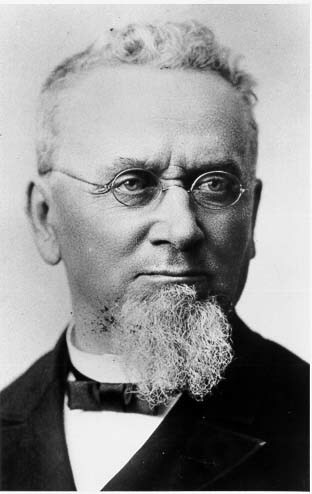 Living on farms near the city at this time were Joseph Glidden, William Plank, Clark Barber and others whose names are enrolled in the list of our early settlers but they were not in the village, which is the honor Mr. Haish contends for. Along in 1854 a Mr. Nichols started a lumber yard here and shortly afterwards a Mr. Page also started one. After that the growth of the little village was steady and rapid, and in all of its growth the personality of Mr. Haish was always prominent. The Chronicle would be glad to hear from others of the old timers.